Do you remember the scene in “Talledega Nights” when Will Farrell’s character, Ricky Bobby, was being interviewed on TV and let his hands float awkwardly into the shot for no apparent reason? Have you ever felt the same way? 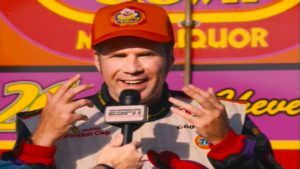 Most of the people I coach tell me the same thing Ricky Bobby said: “I’m not sure what to do with my hands!” Let me offer some assistance. Gestures, like our vocal inflection, are vital when we’re delivering a presentation. They add emphasis and help the audience understand what we believe is important. Think of your gestures as the visual bold, italic, and underlining of your speech. And there’s probably something in every sentence you say that needs a little emphasis. Adding a gesture of some kind will help make your points. I have three guidelines for effective gestures. Give these a try as you practice your next presentation. First, gestures need to be above-the-waist to count. No half-hearted flippy hands down by your legs, please, and no elbows-velcro’d-to-your-side gestures, either. Gestures need to be up where we can see them with air in the armpits. Second, try one-handed gestures. Use two hands when you absolutely need them, but for the rest of the time, one hand is enough. I think gestures instantly look more natural and relaxed when you utilize one just one arm. I know what your next question is—and that leads me right into point #3. Third, what do you do with the hand that’s left behind? Plant it somewhere! Rest those finger tips on the top of the conference table or the side of the lectern. Grasp the top of the chair or flipchart easel you’re standing next to. For many presentations, the leftover hand will be busy holding a hand-held mic or remote clicker. And, contrary to many other speaker coaches, I’m a big fan of one hand in the pocket. I think people, especially men, look instantly cool and calm with one hand tucked away. Now, it can’t live in that pocket for the entire presentation, but it stay there for a short while. When one hand is grounded somewhere touching something, it can instantly relax you. You don’t feel like you’re floating out in space. Then, when you find your groove a few minutes in to the speech, you can let go and have that hand available for gesturing going forward. So, for all you Ricky Bobbys out there, don’t fret. Try these tricks and you can “shake-and-bake” with the best of them, too!